They Were Fighting To Read To The Class (Literally)! Yes you read it right. My students were literally fighting to read to the class. As I mentioned in my earlier posts, I wrote about how I turned a deficit into something positive. Since I didn’t have the required materials (the listening CD), I decided to have them read the Student Anthology. It was so successful, in fact, that the students wanted to read in front of the class. This came about because I told the students that I thought it was time for them to start reading to me instead of me reading to them. They agreed also. So, I told the students that after Recess I would make a list of students to read. I had a list but one or two students decided that they didn’t want to wait, so there was a slight altercation. I really didn’t mind the fight so much because of the reason why they were fighting. I still chastised them a little, but not like I would have if they were fighting for mean and selfish reasons. Initially I’d only planned for one student to read, but they all wanted to read. Far be it for me to interfere with their eagerness to learn. In response to their enthusiastic response, I scheduled 20 minutes after Recess and 20 minutes after Lunch for them to read. I gave out so many claps, high fives, and various compliments today. There was such an air of excitement about learning. It was a great atmosphere in the class. Today, (like the incident last year when I told the students that I was so proud of them for fighting) they became a family. Turning A Deficit Into Something Positive! Since I had to switch to teaching 4th grade, I am, once again, at a disadvantage. I don’t have all of the required materials. However, instead of thinking of it as a deficit or something negative, I choose to think of it as something that I can use to my advantage. The old way that I taught the story was letting my students listen to the story on CD. But, since I don’t have the Listening Library on CD, my students are forced to read from the text. Let me just say (as I puff out my chest) that they did an excellent job. When they got stuck on a word, I simply told them what Sound Spelling card to refer to and they did it. I was so impressed. I had a pep talk with them and told them that I was so proud of how well they blended and that I looked forward to blending with them because it is so fun since they are so good at it. I was proud enough with the blending. Now, I am even prouder with the reading because it shows that they are learning; that I am actually making a difference. One of my students, Lil’ Man, didn’t want to read aloud because he didn’t think that he could do it. I let him know that I knew that he could do it; that I would not embarrass him like that. I told him that I would not have asked him to do it if I didn’t think that he could. He didn’t want to do it, but I gently pushed him and he did it. He couldn’t believe it. He was so proud of himself. He was grinning from ear to ear like a Cheshire cat. Boy was I glad that I chose to see my lack of materials as a positive thing because it definitely turned out to be a very positive thing. What Is Four Step Language Math? (Taken directly from the site) Four Step Language Math is a math intervention program that blends in with any form of teaching, whether it is algorithms, manipulatives, drawings, or repetitive memorization. Four Step Language Math is more like a foundation in which teachers can get reinforcement for their teaching and give students a safe outlet to learn and become true owners of their knowledge. It helps teachers to establish a safe community that fosters communication and learning. It allows teachers to differentiate instruction and assess individual student needs through anecdotal records in a small group setting. Four Step Language Math Intervention Program is composed of four basic components. The first step is based on gathering information about the problem through data identification. The second step is based around analyzing the information gathered and deciding on a strategy that will best help a student solve the problem. The third step is where the students take the information they gathered and use the best strategy to solve the problem. The fourth step is revisiting the process of solving by showing the students understanding of the steps taken to solve the problem. The four steps the students do in class and on their own help them to further comprehend mathematical problems, trains them to think analytically, builds upon their reasoning skills, and gets them to think about their thinking. All of the steps and knowledge are then further enriched when the four steps are discussed in class providing further understanding of math. I had so much to do yesterday that I forgot to wish my oldest son a happy birthday. It was his 19th! My how time flies!!! I’m sure by now that everyone has heard about the tragedy involving Jennifer Hudson’s family. So sad! I was just talking to my husband about the senselessness of it all. How could anyone be that heartless? I would not wish this on anyone. My heart goes out to Jennifer and her family. She’ll be in my prayers. 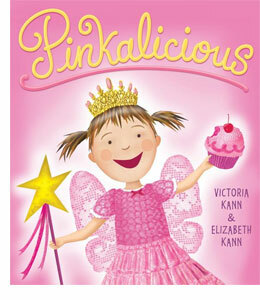 Pinkalicious (2006), written and illustrated by sisters Victoria and Elizabeth Kann, is the cutest little girly book. It had me at hello. I was hooked when I saw the cover. Once I opened the cover and read it I was convinced that I needed to purchase this book for Phillise since she absolutely adores pink just as the title character does. The book begins on a rainy day when it was too wet to go outside. So the little girl asks her Mommy to make cupcakes. What color does she want? Pink, of course! She tastes the cupcakes and decides that they are simply PINKALICIOUS! She offered one to her little brother Petey, but he’s very picky and didn’t want to eat it. So she ate it. She takes a nap. When she wakes up she begs for just one more. “You get what you get, and you don’t get upset,” she said. But she got very upset. Finally her dad tells her that she has had enough and sends her to bed. Does she do it? What happens after that? Well, I guess you are just going to have to read it and find out for yourself. My take- I really liked it and would recommend it to other momies to read to their pink-loving little girls. I’d say the age range is 3-8. I read it to one of my students who’s 8 and she loved it. Last year I identified myself with the 3rd grade teachers since I had mostly 3rd grade students. That’s why it made perfect sense to stay with the 3rd grade teachers last year. This year, I still identified myself as a 3rd grade teacher until I thought about all of the 3rd graders from last year who are now 4th graders. That’s when I realized that I also needed to move with my students. So, I now identify myself as a 4th grade teacher. Although this means that I have to learn new “stuff” (notice how I get all technical with it), I’m willing to do that to meet the needs of my students. So, I need to go to make a new lesson plan. And as always, here’s to continued success!